Got a carpet for your home but it doesn’t look new anymore? These tips will teach you how to clean your carpet effectively and get back that brand new look. Your carpet is the main focus of your room. So, keeping it clean by vacuuming it at least once a week or fortnightly is a habit that will extend the life of your carpet. Prevent dust accumulation by doing so, especially if there are children in the house. Baking soda is a regular for getting rid of odours in general and it works just as well on carpets. If your carpet is unattached to the floor, drying it in the sun is the most natural way to get rid of a stench. Another option would be to add 5-7 drops of your favourite essential oil to any cleaning concoction, spritz the carpet and vacuum after a few minutes. A mixture of lemon juice and salt or hydrogen peroxide (3% or less) and water will help in killing the fungi that cause moulds. A non-chlorine bleach would work just as well but testing it out on an inconspicuous area of the carpet first is advisable. The best way to reduce damage to the carpet due to a spill is by absorbing most of the liquid as quickly as possible with a dry, white cloth. Never rub a stain as it will reinforce the stain/debris into the carpet and wreck the carpet fibres. We cannot stress more on this fact. Work your way inward by starting the blotting process from the edges of the spill. In case of food, pick it up off the carpet and pat the area lightly with a soft, clean paper towel. Apply dry baking soda on the area and let it sit until it foams and pat the area again. Do not rub the stain as it will push the matter deeper inside and make it extremely ugly and difficult to work with later. A mixture of a lower concentration of hydrogen peroxide (upto 3%) and dish soap. This is best saved for light coloured fabrics as hydrogen peroxide is a bleaching agent. Spray soapy water and subsequently, lukewarm water after that. White wine / vodka dilutes the red colour when applied instantly to the red wine spill. Blot the area with a sponge and apply a thick baking soda paste on it. Cover the stain with a clean cloth and apply slight pressure to it. Let it sit overnight and vacuum the baking soda once it is dry. Coffee and other stains can be taken out by using ordinary shaving cream or a liberal amount of club soda and letting it stay for a few minutes before spraying it with water. Pure alcohol will make your ink worries disappear, because that’s where the magic of alcohol lies. Use alcohol on the ink stain to release it from the fibres. Always blot ink or any other liquid from the outside to the inside to avoid spreading the spill. Shaving cream can also be used to get rid of an ink blot. But, make sure you get rid of the foam that is formed by adding water, dabbing gently and vacuuming. Corn flour can help to get rid of sticky messes on the carpet as it dries out the stickiness. But, it must be used immediately. Chewing gum and other sticky substances can also be taken off by using an ice cube to harden them first. Do not fret if wax has dripped onto your precious carpet, especially if it has dried up. Heating it will make it come off just as easily. Place a white cloth over it and iron the cloth for a little less than 30 seconds to warm it up, so that you can scrape it off with a butter knife. One teaspoon of dishwashing liquid (without bleach) should be diluted in one cup of water and sprayed onto the carpet and blotted until the oil / crayon stain lifts. Paper cuts or other causes of blood drops on your carpet shouldn’t raise your blood pressure since the dried blood can be made loose with a concoction of water and a mild detergent. It can then be scraped off. The remaining blood can be removed with hydrogen peroxide. Foaming is normal on application. Blot with a dry towel to finish up. 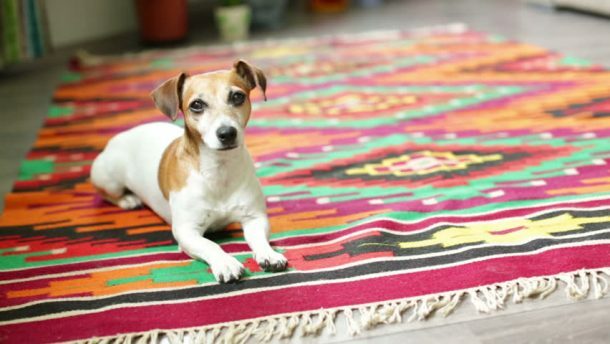 The most well-trained furry friends can accidentally muck up the carpet. One easy, but gradual, DIY solution to this is to create a blend of 30ml of water, 3 tablespoons of brown sugar and 1/2 a cup of citrus fruit peels (like oranges or lemons) in a container. Shake it well and let it sit for 3 months (you read that right) and your naturally prepared suspension will be ready for a cleaning. Blot as much as you possibly can and dilute it with club soda or baking soda. Then apply 1 tablespoon of ammonia to 10 tablespoons of water and spray it on the soiled area. Let it sit for a few minutes, spray cold water over it and then blot again. Vacuum the area after it has dried. We know that most of the remedies we have given you make use of water. But, that is because your carpet has already been ruined. Water ruins carpet texture so keep it as far as it can be kept from carpets, unless it is needed for cleaning. In case of a spill, blot the area and absorb as much water as possible with a dry cloth or paper towels. If there is excess moisture in the carpet, place thick white towels on the spot and weigh them down with a heavy object like a big book to add some pressure. As much as you might have heard about vinegar being a good stain remover, avoid using it since it contains acid and that could ruin the carpet’s delicateness. One obvious piece of advice that we’d like to remind you of is to test any new cleaning method on a small area first. To prevent the carpet from catching rust stains from furniture, place a foil or plastic sheet beneath the legs. If your carpet has lost some colour in the cleaning process, touch it up with a little acrylic paint, felt pens or permanent marker. While looking to buy a home, one of the first things a buyer notices is the condition of the carpet. So, keeping it well-maintained will increase the chances of a sale you’ve been wanting to bag. These solutions cover, pretty much, every carpet complication that could arise and are enough to get you through the tough day you might need them for. Hopefully, you don’t wonder about how to clean your carpet on such a day. Bookmark this guide to access it whenever you need to. Until then, you learn something new every day. Do let us know if you have any additional information relevant to carpet cleaning in the comment section below. Choosing the best floor for your apartment can be a tough decision. Should you stress on looks, durability, or high-quality? The answer lies in finding the right balance depending on your needs, finances, location of apartment, and whether you intend to stay there or rent it out. Here are the three best flooring options you might want to take a look at. Marble flooring is the most popular type of flooring in Indian households. It is also the most expensive type of flooring. Marble is available is a range of three shades- white, black, and green. The pieces normally come in the form of slabs, blocks and tiles. The cost of marble flooring depends on the colour and design pattern. Marble floors are highly durable, and can last for years. On the downside, one has to be careful with spillage, as marble can get permanently stained with certain chemicals or foods. Marble floors also develop cracks easily, and require regular polishing. If you wish to go with marble, you can choose from among Indian, Greek, Italian, or Spanish varieties. Tiles have replaced cemented or stone flooring in most Indian homes. Versatile, durable and affordable, tiles come in a wide range of designs and patterns. Tiles are moisture resistant, and easy to clean. Pet lovers might want to reconsider, as tiles easily crack under stress and rough use. Replacing broken or cracked tiles is however easy, you just need to replace the damaged tile instead of replacing the entire flooring. Tiles come in a variety of materials such as ceramic, stone, metal, vinyl, porcelain, and even glass. Ceramic and vitrified tiles are the most popular variety as they are easy to maintain, and comparatively less prone to scratches. Tiles are however very slipper. 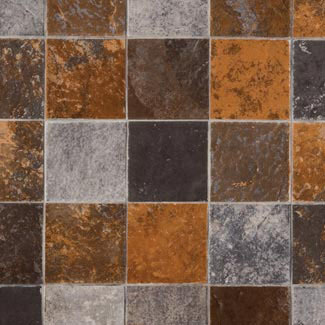 Choose tiles that offer more traction, and opt for anti-skid tiles for bathrooms. Prices for tiles vary, depending on the material, quality and designs. Hardwood floors are an excellent choice for a warm feel around the house. These floors are expensive and can cost you most than marble if you go for high quality oak or teak flooring. Hardwood floors are durable, but are not recommended for pet owners, or for people who like to move their furniture around a lot. They are prone to scratches, and may require regular polishing. These floors also have an affinity for moisture, and attract termites if not well maintained. Hardwood floors come in two types. Solid hardwood floors consist of planks sawn from a single piece of timber. They have a thicker wear surface, and can be sanded and polished more number of times. Engineered wood flooring, on the other hand, is made up of two or more layers of wood that form a plank. These floors are more stable and are the most common type of hardwood floors. Choosing a floor requires factoring in a lot of variables like cost, durability, personal preferences, and not to mention comfort. Research more about the flooring options you are considering, and go for the floor that is most likely to make your house your dream home.